Google quite recently started rolling out a well-known algorithm in the form of “mobile-first” index, changing the entire scenario of how your site is going to be ranked on Search Engine Result Pages. For those unaware of the term, “mobile-first” index refers to now Google crawling on your site as a mobile user, giving more preference to a mobile view. This clearly means that if your site is not optimized for a mobile search, Google bot won’t follow your links, because of which your website might go for a toss. Even the vital statistics regarding a brief comparison between both kinds of users indicate the importance of mobile use. As per this study, 80% of Internet users own a Smartphone. Eveb they prefer using mobile for using any type of referral software for the work too! In short, Google is taking the whole idea of user experience very seriously, and if your website is not optimized for a mobile search, you are surely set to lose business, or probably are already doing so! 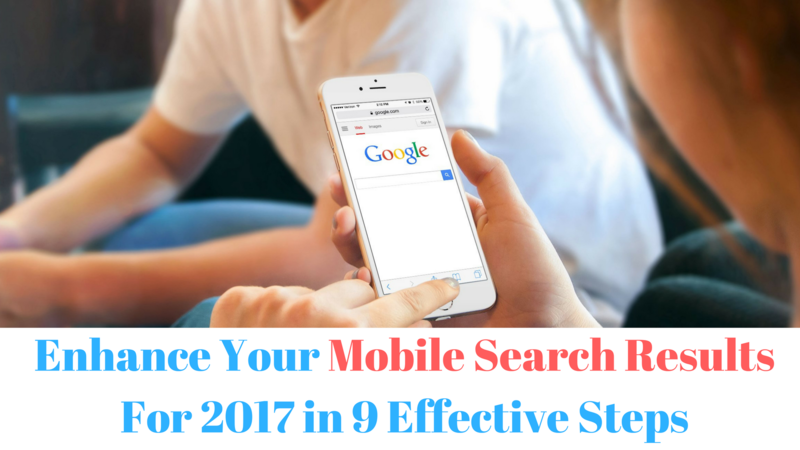 So how to go about taking care of mobile search results in 2017? Let us find out. Most business owners and marketers have realized how important it is to consider mobile search ranking factors nowadays to make your website mobile friendly. Having one size for your website fitting all sizes optimizes content for both a website and mobile. As per a study from Google in May 2015, Japan and US are among those 10 countries wherein Google Search happens more on mobile devices rather than desktops. Site Loading Time should not exceed more than 1-2 seconds on mobile. Remove all flash components or keep it as minimal as possible if necessary. While choosing a domain name, do not go for keywords rather select what will suit your brand. When you look at high ranking mobile pages, they make use of unordered lists, because they tend to be shorter. It is best to keep bullet points with less content in place. There have to be as many fewer numbers of internal links possible with mobile content. A number of internal links will only enable your content to lose value. Place only a few meaningful images possible, while avoiding the irrelevant ones. Try to have no more than 3-4 images per page, unlike desktop having 8-9 images. As discussed earlier, 1-2 seconds is the average time a mobile site should take to load. To do this you need to implement AMP framework that helps you to build mobile pages delivering content as quickly as possible. Yes, it’s true. With mobile-friendly label gone, now the site is displayed on search engine result pages without a mobile label present above the snippet. Mobile consumers or shoppers are inclined towards mobile search, expecting results located within few miles from the Smartphone location. The reason seems pretty clear. Mobile customers want to take action as immediate as possible, and hence they opt for mobile search so that they get results within the proximity. Analyze the key performance indicators for campaigns that are geo-targeted. Keep experimenting with ad copy that works best within a specific geographical radius. Understand the difference between the business located nearest, nearer, or near to your place. Accordingly, use keywords in your copy. Even with mobile-friendly label disappearing from the screen, this hasn’t changed the scenario surrounding the mobile search ranking factors like making use of text that is readable and zoomable on mobile, sizing content as per the screen so that users do not have to scroll horizontally, and placing links far away for ample space between the two. Keywords are an important parameter to consider. However, avoid doing keyword stuffing, since the content value gets lost. Since people spend less time in reading content on mobile; try to have half the keyword density, as compared to desktop. The overall number of words should be lower than the desktop version, allowing users to get the message effectively, within shorter content in place. Try to include more proof related terms within mobile content, for a successful optimization. Strong social signals will have a high positive impact of your mobile content as compared to mere inbound links. With decreasing importance of inbound links on mobile, you need to spread the word socially for getting more traction on mobile search. Yeah, that is very true! If you are still thinking whether your mobile friendly site is actually mobile friendly or not, you do need to constantly update yourself with Google, in order to have your site satisfy all parameters of being mobile friendly. Mobile-friendly is the mantra nowadays with every business across the globe. People are spending more time on Smartphone, then possibly with their own family. Still, if your site is not appearing good on mobile, you do need to put all the above tips to work and hire digital marketing agency. While doing so, ensure that you are not breaking any barriers of Google.